AIDA CAMP, West Bank, Oct 10 2016 (IPS) - Over almost five decades of Israeli occupation, the number of Palestinian refugees has grown with every generation, saturating basic services in the 19 camps that are home to about 200,000 people in the West Bank run by the United Nations. “Every year, the camp becomes more and more crowded and difficult to live. We don’t have privacy, any comfort, it is not easy,” Mohammad Alazza, 26, told IPS. He was born and raised in Aida camp, 1.5 km north of the city of Bethlehem and bordered by the 721-km wall that separates Israel and the West Bank. Families in Aida endure spotty water provision and frequent energy shortages. Nearly all households are connected to water, electricity and sewage networks, but they are old and in poor condition, the UN says. After a recent agreement with the Palestinian Water Authority, water is provided to Aida camp for two days every other week. Next year marks the fiftieth anniversary of the occupation since 1967 and a hundred years since the Balfour Declaration (1917), that is said to have laid the foundation for the formation of the State of Israel. Founded in 1950, Aida’s first inhabitants came from 17 villages destroyed in western Jerusalem and western Hebron during the creation of the state of Israel in 1948, what Palestinians call ‘nakba’, catastrophe in Arabic. “At that time, the families that were expelled from the villages had the expectation they might come back to their houses someday. They just closed their houses and took the key with them thinking the war would be over in some weeks. We are still waiting for this moment to come,” stressed Alazza, whose grandparents originally came from Beit Jibreen. At the entrance of the camp there is a tall gate with a huge key on top, symbolising what Aida’s families claim as their right of return. “Each family still keeps the original key from their homes. People believe that one day they will go back to their land. We live with this hope and we believe this occupation will end eventually,” Alazza said. There are currently 5,500 people living in Aida registered at the United Nations Relief and Works Agency for Palestine Refugees (UNRWA), of whom around 3,000 are children. The camp faces serious challenges related to overcrowding, lack of space, poor infrastructure, high levels of unemployment, food insecurity and protection issues due to regular incursions by the Israeli army. The director of UNRWA operations in the West Bank, Scott Anderson, says that due to the occupation, the Palestinian economy is stagnant. He added that human rights for Palestinians are still not fully embraced. Israeli settlements continue to exacerbate tensions. “It is challenging if you are a Palestine refugee. Everything is a bit worse in the camps: unemployment rates, housing, access to water and electricity. Despite their resilience, they have a difficult reality,” he told IPS. Aida camp is located between the municipalities of Bethlehem, Beit Jala and Jerusalem and is near two large Israeli settlements – Har Homa and Gilo – considered illegal by the international community. “Gilo is less than two km away and they have 24-hour fresh water, gardens and schools for children. We live just next to this settlement and we suffer from lack of all of these. We’ll never accept this. My home village is 40 minutes distant and I can’t reach it. It is not easy to be a refugee in my country,” Alazzo complained. 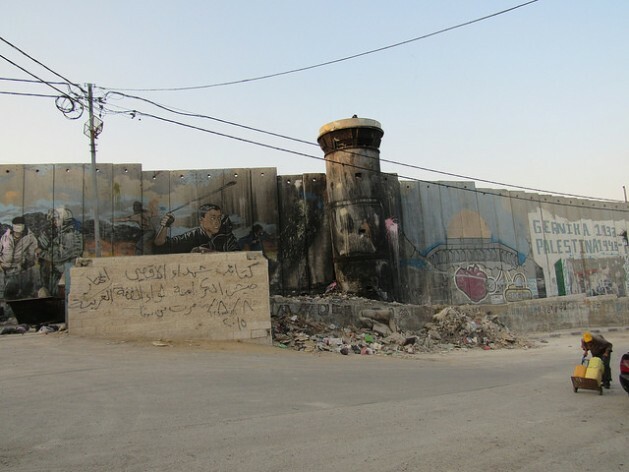 Aida has been a hot spot since the Second Intifada (also called as Al-Aqsa, a Palestinian uprising started in 2000) and refugees became highly exposed to violence as a result of military operations. The increasing number of injuries in the camp are due to excessive force documented by the UN. In 2015, there were 84 incursions by Israeli security forces, 57 injuries (21 were minors), 44 arrests (including 13 minors), and one fatality with the death of a minor. Walking through the alleys and narrow streets of Aida, it is common to hear stories about men and boys taken from their homes by Israeli security forces. “We’re always afraid of our sons being taken by Israeli army. I never leave them alone. It is normal for the Israeli soldiers to take kids. It’s a scary life,” Sumayah Asad, a 40-year-old mother of six, told IPS. It was a Friday morning, a sacred day for the Muslims, and she was handing out chocolates and sweets as gifts to whoever passed in front of her house. Asad said she was celebrating her 12-year-old son’s release after five days in detention. “I’m happy now to see my son released from the Israeli occupation. Soldiers came to my house at three in the morning and caught my boy. They let him out after discovering he hadn’t done anything. Kids should be playing or be in the school, not in jail,” she said. Although not everyone agrees that coexistence is possible among Jews and Palestinians, Munther Amira, 45, who was born in Aida and whose family came from the village Dier Aban (South Jerusalem), remains optimistic that peaceful change can be achieved. “Yes, we can coexist. The idea of coexistence is based on human rights and should include our right of return. Here in Palestine, Christians and Muslims already live together. It’s difficult to develop a democracy under an occupation,” he told IPS. Amira is an activist with the national Boycott, Divestment, Sanctions (BDS) campaign. In his opinion, boycotting Israeli products is a peaceful tool to bring pressure in order to reach into an agreement. “We are under siege. We can’t import anything without the permission of the Israeli occupation. By boycotting Israeli products, we support the freedom of Palestine. It’s a non-violent tool against the occupation, if it’s done collectively, it’ll be very effective,” he suggested. Sadly I really do not believe anyone really cares about the plight of the Arab Palestinians. When did ANYONE ask about the missing over 30 billion dollars of international aid (since 1993) for Arab Palestinians ? Lost and unaccounted for by the PA & Hamas … the only thing media & the UN does is blame Israel… some bodies are getting paid off. HOW ABOUT THE TRUTH FOR ONCE ?